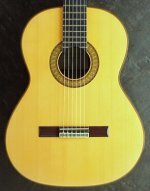 Excellent condition Engelman & Indian 650 scale classical guitar. French polish finish has some minor play wear on top. 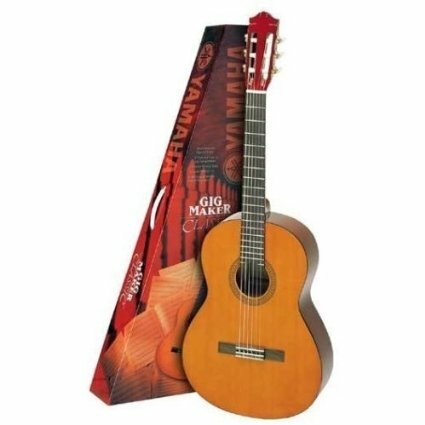 This Francisco Hernandez 2005 classical guitar is a great sounding, balanced concert level guitar with wonderful action. Beautiful craftsmanship and design. Professional finish restoration to new condition is available for an additional $300. This guitar is no longer available. New guitars built by Francisco Hernandez in my workshop are available from me and from dealers across the U.S.
Is this guitar still available for sale? This guitar is still for sale. If you can come to my shop in Santa Cruz, CA, you are welcome to try it out. I'm willing to talk about the price, but it's unlikely I'll come down much on that. Look at the Francisco Hernandez guitars for sale at Savage Classical Guitar or Dream Guitars to get an idea of what they're selling for. 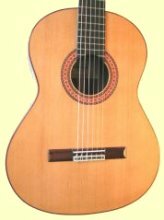 I do have a guitar built by Francisco's brother Ignacio that I could sell for less--$1,200. 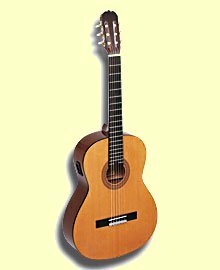 It's a beautiful sounding, well built guitar, but the French polish isn't up to the cosmetic standards of Francisco's guitars. I'm wondering if this guitar is still for sale. Can I try it before buying? Would you take less for it?